Havel River is a tributary of the Elbe. It passes through the northeastern German federal district Mecklenburg-Vorpommern, in Brandenburg, the region of Berlin and Saxony-Anhalt. Havel liaises with the river Oder to the channel Oder-Havel Canal, which connects the Oder to Berlin and the Elbe. The name of Havel River in Latin and Greek sources are recorded as Habola, Habula, Havela. German etymology of the name are the words Haff, habe, hafen and can be translated in the broadest sense as a port. By the time the Slavs settled in the lands around the river Havel, her name was Heveller and rarely Havolane. 30 km of the total length of 325 km of Havel flows through the German capital in the direction from north to south. However, before reaching Berlin, Havel River originates from a group of small lakes on the border between the Baltic and North Seas. The spring is in the area between Lake Muritz and city Neubrandenburg. In the upper part between Berlin and Brandenburg of the Havel River have been formed several lakes. Their main tributary is the River Spree, which joins the Havel in Spandau - a western suburb of Berlin. The area around north of the central part of the Havel is known as Havelland. Here the natural picture is composed of sandy hills and low marshes. In the last few miles Havel and its streams enter the territory of Saxony-Anhalt, where it empties into the Elbe near Havelberg. Due to the minimum slope of Havel, it is able to flow into the rather high waters of the Elbe. On the Havel River were built four major bridges. The first is that in Spandau, the second is a bridge in Potsdam, third - in Brandenburg and the fourth is the aggregate concept of the bridges over the Havel in Berlin. 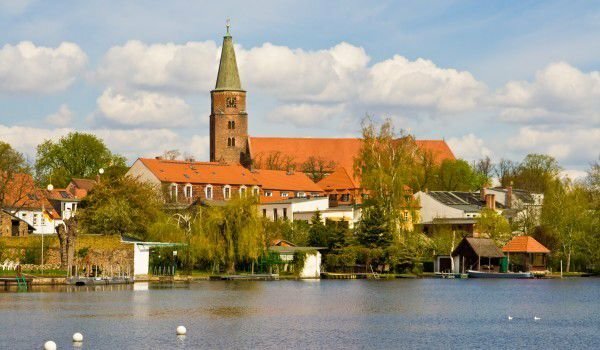 Among the most important cities in which the Havel runs is Furstenberg, Zehdenick, Oranienburg, and of course, Berlin, Potsdam , Werder, Ketzin, Brandenburg, Premnitz, Rathenow and Havelberg. In Berlin, there is one attractive way to get acquainted with the landscape features of the river Havel , namely - a boat trip downstream. Since 1990, all waterways in the capital Berlin are going again in summer, and now boats are available from both private companies and the state.